There is no doubt the St Louis real estate market has been HOT thus far this spring and homes are selling well. Personally, four, of the last five listings I’ve taken, sold within the first day of hitting the MLS. Granted, there is a lot that goes into this in terms of pricing, marketing strategy etc., but even with everything done perfectly we weren’t seeing results like this last year. As you have heard me say many times though, real estate is very local and not all markets perform the same. There may be drastically different results between two neighboring areas or even between two price ranges within the same neighborhood, which is why good, accurate local market data with an “apples to apples” comparison is more important than ever today. 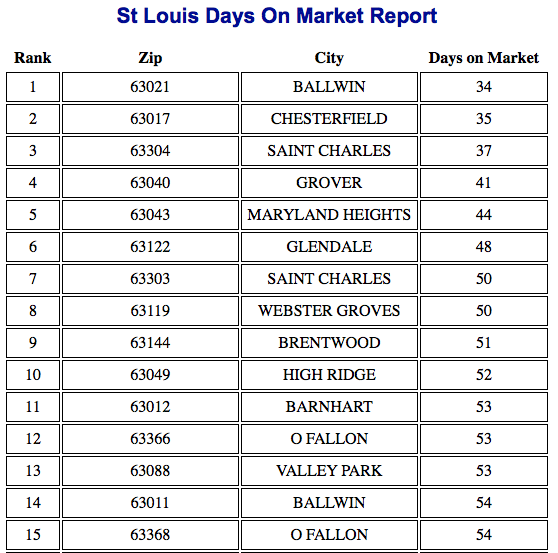 With this in mind below is my list of St Louis’s fastest selling neighborhoods based upon the average days on market of the homes for sale in those neighborhoods as of today.